Quack! Quack! 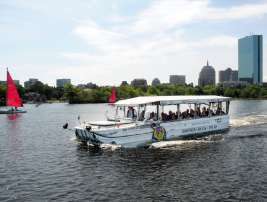 - A sound you hear frequently in the streets of Boston as one of the many Duck Tours wind their way around the city providing riders with rich (sometimes creative) history and stories of Boston before SPLASHING into Boston Harbor or the Charles River. Boston has few Duck Tours competing for your business, each with it's own unique appeal.